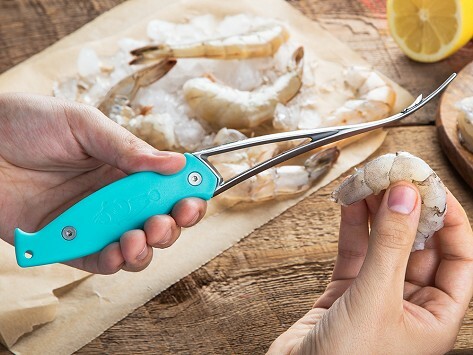 This shrimp deveiner makes a messy job easier—even the peeling and butterflying jobs—all at once and in one motion. A stainless steel blade extends fully into the recycled plastic handle for extra durability. And for each cleaner sold, 10 square feet of oyster beds are replanted. Great tool! Wish I had purchased it sooner! I gave this as a gift to my husband. It looks like it will last - high quality manufacturing. Works just great. Gave this to my husband, who loves shrimp. Best gift ever. He uses it all the time. If you like shrimp, you need one of these. The shrimp deveiner, oyster shucker, and shucking cloth from Toadfish are built to handle seafood better and make prep jobs easier—which fits perfectly with Maker Casey Davidson’s South Carolina location and his team’s passion for preserving coastal habitats. Toadfish gives back to the ocean in a big way by replanting 10 square feet of oyster beds for every tool sold and by recycling not only oyster shells, but their tools, too. As coastal populations continue to grow, so does the amount of pollution and run-off created. Oysters help to filter ocean water and their efforts are more important now than ever. The three-in-one shrimp cleaner makes deveining, peeling, and butterflying much easier and much less messy. The stainless steel blade does the three jobs in one single motion. The oyster shucker shares the same full tang style blade and recycled plastic handle and has a bent tip that makes the shell-opening job an easier one. Grab the shucking cloth to get a better grip on that shell and to better protect your hands. It’s cut-proof, puncture-resistant, and anti-microbial. The quality of the tools speaks to Toadfish’s commitment to making it easier for folks to enjoy seafood, and their commitment to coastal areas shows how much the sea means to them.